Eminem may be ready to release new music as a member of D12. A former Eminem producer, Mark Bass, recently said he’s mixing new music by D12 in a Detroit Free Press article published January 19. “Bass, who has started a label called Motunes Media, says he’s also been mixing new material by the mercurial funk-pop giant Sly Stone with members of the original Family Stone band, along with new D12 tracks, including three with Eminem,” the article says. 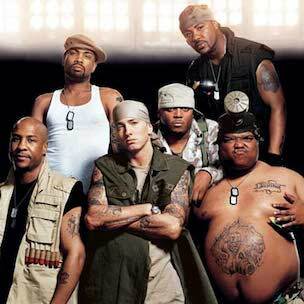 D12, which featured Eminem, Proof, Bizarre, Kuniva, Swifty McVay and Mr. Porter, has released two full-length studio albums by way of Interscope and Shady Records. In 2001, D12 released its debut album, Devil’s Night. In 2004, D12 released its most recent album, D12 World. Proof died in 2006 due to fatal gun shots. In 2010, Eminem paid tribute to his close friend and longtime partner-in-rhyme Proof with “You’re Never Over,” a selection off Recovery.